Book your cheap minivan and taxi transfer to Sitia port at the best price guaranteed. TransferPlan will transfer you from Heraklion airport to Sitia Port as quickly, safely and comfortably as possible. Heraklion International Airport, "Nikos Kazantzakis" is the primary airport on the island of Crete and the country’s second busiest airport after Athens International Airport. It is located about 5 km east of the main city center of Heraklion, near the municipality of Nea Alikarnassos. It is a shared civil/military facility. TransferPlan will transfer you from and to Sitia port as quickly, safely and comfortably as possible. Sitia is the easternmost harbour of Crete and is located in the heart of the town. Sitia port is visible even during the daytime because of the lighthouse on the Akrotiri Vamvakia. Sitia has good shopping for all provisions. There is water on the quay and fuel refill may be arranged. Minor repairs can be done in Sitia. There are Port Police and Customs Officials but no Immigration as Sitia is not a Port of Entry. Sitia has a General Hospital as well as private doctors, dentists, and pharmacies. There are banks and telecommunication facilities and post offices with full services. The town of Sitia has many hotels and tavernas. The stern-to bow-to mooring in the harbour provides good protection from all winds. The harbour entrance is lit by a flashing green light on the right and a flashing red one on the left. The picturesque harbour in Sitia is usually crammed with traditional fishing boats and visiting yachts. The area around the port of Sitia is very beautiful and has got lots of taverns, restaurants and cafes. In Sitia, apart from swimming in the long beach east of the city, you can enjoy your coffee in the many cafes in the beach road, get lost in the old town with the traditional houses and the picturesque yards, visit the castle Kazarma and the ruins of a Venetian monastery. Moreover, you could visit the Archaeological Museum with exhibits from 3500BC to 500AC, all coming from the wider area of Sitia. A folklore museum exhibition also operates in the town with traditional objects of the 19th and 20th century. Lastly, it is worth visiting the local produce stand, where you can learn about the products of Sitia. Among them are olive oil, Cretan wine and raki, a traditional Cretan spirit. Indeed, the oil of Sitia is the best in the world, winning several international awards every year. 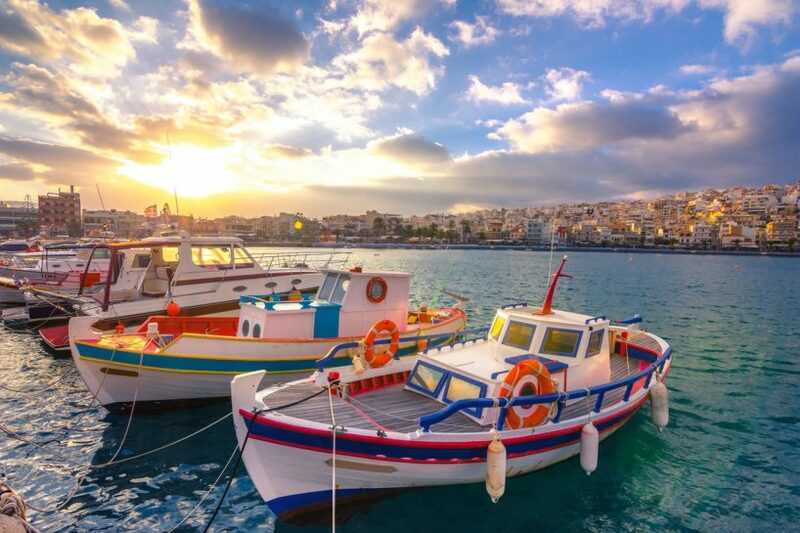 Book your Crete port transfers now. Enjoy a high-quality service at the lowest prices. Best price guaranteed. That’s why we are Crete’s favourite airport transfer company.